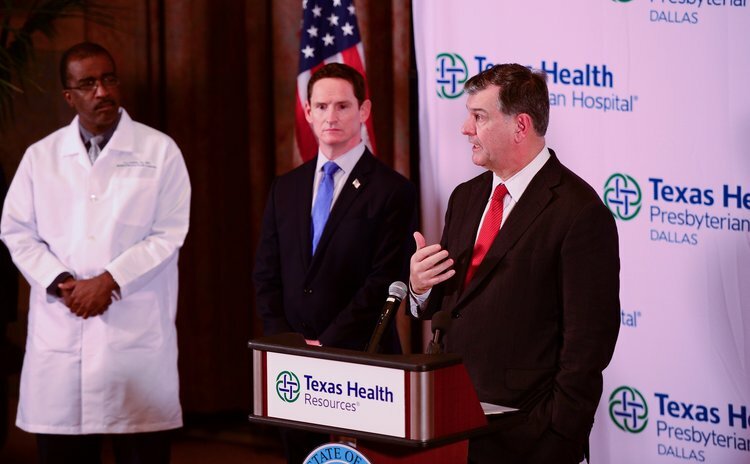 HOUSTON, Oct. 1, 2014 (Xinhua) -- Dallas Mayor Mike Rawlings (R) speaks during a press conference at Texas Health Presbyterian Hospital in Dallas, the United States, Oct. 1, 2014. WASHINGTON, Oct. 3 (Xinhua/Sun) -- A patient is being treated at a hospital in Washington DC with Ebola-like symptoms, U.S. media reported Friday. The patient, who is not identified and is said to have traveled to Nigeria recently, is reportedly in stable condition and has been isolated at Howard University Hospital in Washington DC. If confirmed, it would be the second Ebola case in the U.S.
"In an abundance of caution, we have activated the appropriate infection control protocols, including isolating the patient," local media reports quoted a statement from the hospital as saying. "Our medical team continues to evaluate and monitor progress in close collaboration with the CDC and the Department of Health." A Liberian man was tested positive for Ebola at a Dallas hospital earlier this week, becoming the first person diagnosed on American soil with the deadly virus.